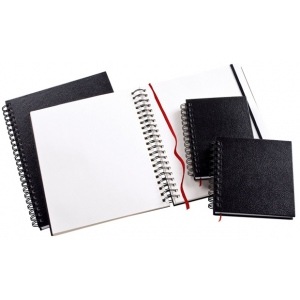 Ideal for sketching drawing and writing these allpurpose sketchbooks feature artist-quality paper double-wire spiral binding and water-resistant leather-textured black covers that flip back-to-back to provide stiff support for field use. * Includes a built-in elastic wrap to keep book closed when not in use. * Each book has 80 sheets (160 pages) of white acid-free unlined paper that is lightly textured for excellent results when used with pencil charcoal crayon pastels and other dry media. * The 70 lb. (110gsm) paper is perforated for easy removal erases cleanly has high-opacity and minimal bleed-through when used with markers or pen and ink. * Dimensions shown are page sizes after removal at perforation. * Covers are slightly larger. * Second dimension listed is binding length. The binding is wire bound. The quantity is 110 sheets. The weight is 70 lb.